On January 1st, savouring my day off work and determined to get the year off to a good start, I settled down with Still Glides the Stream by D.E. Stevenson. There is nothing quite so nice as beginning a New Year in the company of an old, dependable friend. Published in 1959, Still Glides the Stream begins with thirty-five year old Will Hastie returning home to Scotland after years abroad in the Army, intent on learning to farm the family estate, Broadmeadows. Will settles in quickly, enjoying his time with his father and reigniting his acquaintance with the Elliot Murray family. Growing up, Will and the Elliot Murray children, Rae and Patty, had been inseparable. By the time the story begins, Rae has been dead for many years, killed in France during the war. Patty, still at home and still unmarried (though engaged) at thirty-four, is just as friendly as ever though and she and Will are delighted to strike up their old friendship. When Patty mentions a curious letter she received from Rae shortly before his death, Will tells her not to worry herself over it. But, knowing that Rae would never have written such odd words without some purpose, he privately decides to look into the mystery. He leaves for France soon after (conveniently avoiding meeting Patty’s awful fiancé during his visit). In France, he discovers Rae’s secret: his friend had married a French girl, Julie, and was not sure how to tell his family about her. Will tracks down Julie and discovers not just Rae’s widow but also his son, Tom. Julie’s excuses for not having made her husband’s family aware of herself or her child are rather weak but handy for plot’s sake so we won’t dwell too much on that. Conveniently, both Julie and Tom speak excellent English; Julie, knowing how much Rae loved his family home, has seen to it that Tom had English lessons so that he would one day be ready to join the Elliot Murrays’ world. Will brings Julie and Tom back to Scotland, everyone adores them, etc, etc. Will briefly thinks he is in love with the lovely Julie but by the end of the book realises that, of course, he has been in love with the steady Patty all along. All ends well, with everyone suitably married off and young Tom happily adapting to his new Scottish home. Julie is an interesting D.E.S. character. She is very lovely and good and, though in some ways Patty’s rival, the two become dear friends. But she is cold and cautious in a way that horrifies Will when he realises it. She wants a steady, comfortable life, not a love affair, and so is perfectly happy to marry for position rather than passion. She wants to be back among people she understands, whose customs she knows. “To me,” she says, “it seems sensible and right to marry a good kind man, to be his wife and the mother of his children.” Patty and Will, both romantics (albeit of a silent Scottish strain), are deeply disillusioned with her after this revelation. I, personally, rather admire her level-headed pragmatism. Still Glides the Streams fits neatly in among the bulk of D.E.S.’s good-but-not-great works. The plot may be flimsy and the characters one dimensional but D.E.S. had a gift of making such unpromising stuff into something really charming. I *will* read a DES this year – I really will! They sound so lovely! Haven’t read this one yet, though it is well up on my “look for” list; it seems to be one of the easier-to-find DES titles, sharing the top of the search list with Gerald and Elizabeth. Just wanted to say I am about 20 pages from the end of The Rosie Project. Omigosh. What an adorable book! Loving it. 🙂 Stayed up way too late last night reading it, and am going to finish it right this minute, as soon as I finish checking my email. Thank you for the recommendation! Well thought and written review, Claire. 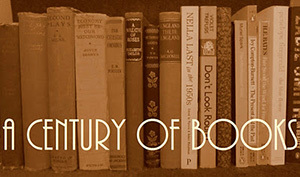 It sounds like a good read for this time of year, in spite of a few glitches in the telling. I still haven’t read D. E. Stevenson, though I have one or two on one of my piles. Must remedy that. Yes, the one thing I’ve never felt comfortable with in that book (which I otherwise like) is the disposition of Tom. His father’s family take it for granted that of course he must go and live among strangers, away from his mother and his own country and his current life, for the sake of The Estate. In fact, everyone takes it for granted. Heartless, really. I’m reading Miss Buncle Married right now and thoroughly enjoying it though some people think it’s not as good as Miss Buncle’s Book. Isn’t it odd how different the Stevenson books are from one another? I read Still Glides the Stream just after Miss Buncle and the Mrs. Tim books (and they certainly couldn’t be much different from one another) and could not believe that it was the same author! I’ve enjoyed them all in their own way, but I miss the DE Stevenson of the Mrs. Tim books. I am reading Mrs. Tim of the Regiment right now and really like her gentle humor (though I am struggling with the Highlands visit – will it ever end?). I think I’d like to read more of her work after I read the Mrs. Tim books. And this will count for the Read Scotland 2014 challenge as D.E. is from Scotland! I am so grateful to you for introducing me to D.E. Stevenson. Since Christmas, I have plunged into her works. I’ve read Mrs. Tim of the Regiment, Miss Buncle’s Book, Miss Buncle Married, and now I’m on to Mrs. Tim Gets A Job. It’s “frightfully” hard to find her books where I live in The States, but I’m devouring what I can get my hands on. Stevenson is perfect for winter reading, and I love early-mid 1900s British Lit. Thank you! I asked my library to order the Miss Buncles and I was surprised that they did. I think it’s because they’ve been reprinted by Sourcebooks. And I was lucky to have The Two Mrs. Abbots arrive the day after I finished Miss Buncle Married. I’ll have to buy the others. Libraries here don’t have too many Stevensons as MiaTheReader said. I actually have this one on my shelf. I may need to pick it up today.Very gray and rainy here. Just requested my first D.E. Stevenson book (The Baker’s Daughter)! 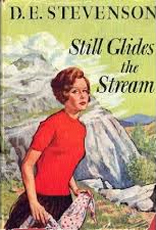 Flora Thompson (who wrote Lark Rise To Candleford) also wrote a book called Still Glides the Stream. It’s not as wonderful as Lark Rise, but still worth reading.